This study examined the perceptions of officers with colleagues who perpetrate acts of domestic violence. This was a qualitative research design from a phenomenological perspective. The data was gathered by the use of face-to-face interviews using open-ended questions. The data was analyzed by the use of bracketing, horizonalization, clusters of meanings, textural and structural descriptions, and the invariant structure of the phenomena described by the study participants. Upon completion of the 30 interviews, the audio tapes were all transcribed, and loaded in to Atlas Ti for the purpose of coding the data for the major themes. A constant comparison method was used to analyze the data to help identify the similarities and differences between the study participants' perceptions with the phenomena. The five qualitative questions each depict a different area of experience with the phenomenon, to create a holistic picture of the perceptions of the thirty participants. 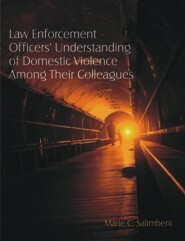 The findings suggest that for some officers, the inability to separate their police role from their civilian role may be a factor in the perpetration of domestic violence by law enforcement officers. The findings also suggest that social workers may be able to play an important role in the remediation of the problem of domestic violence for those within and outside police social work settings.